Jarrod Jones can give Ball State basketball fans something to cheer about Thursday if NBA teams give the man a chance. This Thursday may be a big night for Ball State, but for Jarrod Jones it is going to be a big night no matter what. Whether you love the NBA draft or not Ball State can use the positive news of Jarrod Jones getting picked. Let’s face it, the winter and spring sports seasons did not go according to plan. With the both the women’s basketball and baseball coaches resigning along with the men’s basketball coach under fire it’s been a long six months of 2012 for Ball State sports. Sure, the softball team won the conference regular season title and men’s volleyball upset Ohio State at home but the bad has outweighed the good. The NBA draft is a chance to break the streak. If Jones is picked then maybe fans go from burying the basketball teams to a positive spin for next season. Heck, Billy Taylor will have the “I recruited and coached and NBA draft pick” defense the next time fans call for his head. For Ball State to produce a draft pick it is a big deal, no matter when he is drafted. If Jones does not get drafted fans have to wait for the football opener to snap the streak of negativity in 2012 and we all know that Eastern Michigan is not a sure thing anymore. I know many Ball State fans have their doubts about Jones in the NBA. Hearing his name on mock drafts or seeing scouts in Worthen Arena appeared to give fans more puzzling looks than excitement. There is a market for Jones. His senior season he developed his jump shot to the point where he was launching threes. A 6’9’’ guy who pushes defenders to the perimeter has potential value as a power forward in the NBA. Tall men who can shoot are hard to come by giving Jones a chance to be drafted. The video below show Jones doing everything he can to bring Ball State back in their game with IUPUI. Jones scores, rebounds, and is fouled inside a minute of action. Ball State would go on to lose in what turned out to be the final game in Conseco before it was renamed Banker’s Life. On the negative side one could say that since Jones was focusing on his jumper he lost his aggressiveness as a post player senior year. Detractors also point out his relatively skinny frame will hinder him more in the NBA than it did in college. It was frustrating to watch opponents put less talented big men on Jones but were able to guard him because of their girth. This was the result of Jones having to play center or the five spot even though his body was suited for the four. Jones was pretty much the only big the Cardinals could roll out to play that position so he was forced to guard players with weight advantages. When he played with the added muscle of Malik Perry junior year the Cardinals had more success. Jones does not have to worry about being double teamed as often in the NBA. MAC coaches gave Jones first priority as defenders would swarm every time he touched the ball. 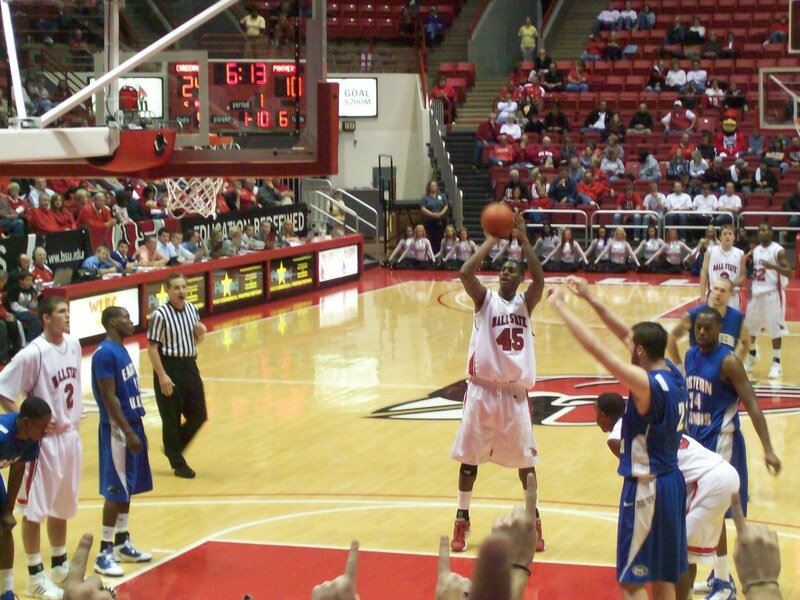 If Ball State’s guards failed to hit jumpers, Jones did not have a chance to reach his potential. Jones will not be the only threat on his new NBA team. Then again what if he gets drafted by the Charlotte Bobcats? I would love my Pacers to draft him. Jones has to be better than say Jeff Pendergraph. If you do not know who that is that is the point. Sadly, Indiana traded their second rounder to Toronto to rent Leandro Barbosa for three months enabling him to commit turnover after turnover against the Miami Heat. How did that work out? Turn this ship around Jones. For the first time I will be watching the second round of the NBA draft like it is a playoff game.